Frank Agsteribbe (1968) is a Belgian conductor, keyboard player, composer, and visual artist, always searching for direct expression and colourful music making. His repertoire reaches from the 16th century till the music of our time, including opera, vocal and instrumental baroque music, and various contemporary art forms. Always aiming for informed performance practice, he nevertheless uses the information to achieve a living, contemporary artistic experience. With many years of experience in different aspects of musical life, he constructs bridges between history and present, between knowledge and expression, between composing and performing. Having studied harpsichord and organ with distinguished teachers as Jos Van Immerseel, Gustav Leonhardt, Davitt Moroney and Luigi Ferdinando Tagliavini, Frank Agsteribbe was invited to join famous baroque ensembles like La Petite Bande, Collegium Vocale, Huelgas Ensemble, Anima Eterna, and Concerto Köln, with whom he performed worldwide. In 2005, Frank Agsteribbe, together with bass player Tom Devaere, founded the new, young and dynamic Flemish B’Rock baroque orchestra. He has been the first musical director until 2013 when he decided to focus on composing and conducting. B’Rock is now well established in Europe and Frank has conducted them during the Opera Festival in Rotterdam, the Festivals of Potsdam Sanssouci, the Klara Festival van Vlaanderen Brussels, the Gergiev Festival in Rotterdam and the MA Festival Brugge, where he also directed a special event of John Cage’s HPSCHD. He has led them in a production of Cage’s Alas Ecliptcalis for deSingel, Antwerp and conducted a production of Purcell’s Indian Queen for the Brussels Kunstenfestivaldesarts. In 2010, Frank was the featured young artist at the 2010 Klara Festival van Vlaanderen in Brussels. He conducted the opening concert of the festival held at BOZAR, in a special Mozart programme with Concerto Köln, soprano Simone Kermes and pianist Alexei Lubimov. He also directed a theatre production of Bach Danced with the dancer Claire Croize and the music of J.S. Bach. Frank Agsteribbe has made many recordings. With B’Rock he has CDs of Haendel and Telemann and a CD of the 18th Dutch composer David Petersen, and Vivaldi’s 4 Seasons combined with John Cage’s Quartet in 4 Parts in a special arrangement by Frank for baroque strings – all on the Etcetera label. He recorded a solo CD devoted to keyboard music by the young Haydn, on the Richard Dott organ in Illzach, Alsace, France. In 2013 he recorded his new compositions for the Viennese fortepiano on his original Schantz from 1828. With cantoLX, he recorded the two books of Arie Musicali by Frescobaldi for the label Et’Cetera, which was honoured by the nomination for the 2015 International Classical Music Awards. As an opera conductor, his repertoire starts with the earliest baroque operas as “La Dafne” by Marco da Gagliano (1608), over “L’Orontea” by Marc’Antonio Cesti, “Dido and Aeneas” by Purcell, includes Mozart’s “Zauberflöte”, Bertoni’s “Orfeo” (1776) and Rossini’s “Italiana in Algeri”, romantic opera as Puccini’s “La Bohème”, and goes well into the 20th century with “The Rake’s Progress” by Stravinsky, “Jenufa” by Janacek, “Le Vin Herbé” by Frank Martin, and Giorgio Battistelli’s “Prova d’Orchestra”. He has worked at the Vlaamse Opera (Antwerp-Gent), the Ruhrtriennale (Germany), Castleward Opera in Belfast, Teatro Sao Carlos Lisbon, and Le Grand Théâtre Luxembourg. In spring and summer 2012, he was engaged by La Monnaie in Brussels as an assistant of René Jacobs (Haendel, “Orlando”), and in the Aix-en-Provence Festival in “La Finta Giardiniera”(Mozart). An experienced orchestral conductor, Frank’s symphonic orchestral repertoire ranges from Beethoven to Mahler and Brahms to Schoenberg and Britten. Choral repertoire also features well in his repertoire and he conducted the English première of Robert Levin’s new edition of the Mozart c-minor Mass K 427, during the Dartington International Summer School. In December 2013, he conducted the Luxembourg Philharmonic Orchestra, and in 2014 several concerts with the Belgian National Orchestra followed. Frank Agsteribbe is the founder and principal conductor of the Luxemburg based vocal ensemble cantoLX. Since its inaugural concerts in 2010, cantoLX is now firmly established in the music scene around Luxembourg, and in 2011 made its debut appearances at the MA Festival Brugge, the Utrecht Early Music Festival and at the Philharmonie Luxembourg. cantoLX turns toward various repertoires, with a special liking for early music, and currently features composers such as Buxtehude, Couperin, Faure, Frescobaldi, Scarlatti, Schütz, Tuma, Victoria and Zelenka. In 2012 it presented its first recording with Frescobaldi and Cage. 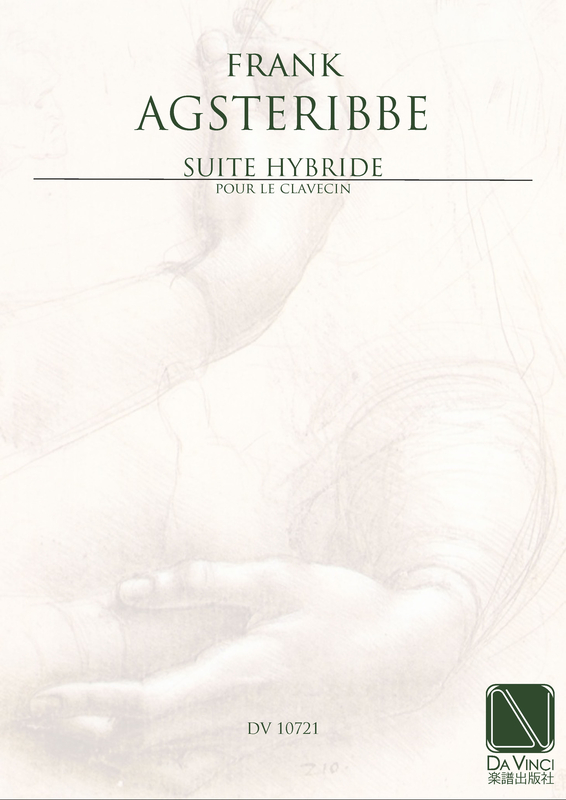 Frank Agsteribbe has written more than 100 compositions, most of them commissioned by e.g. the Flemish classical radio, the Deutsche Oper Berlin, music theatre company Transparant, November Music. More than 40 compositions have been recorded by the radio or are available on CD. His composition Et nova sunt semper, written for the European Radio Union, has been broadcasted throughout Europe, Canada and the United States. For De Bijloke in Ghent, Frank Agsteribbe wrote a new composition for 6-octave fortepiano, to be premiered by Ronald Brautigam. Frank also wrote the obligatory work for the MA Festival Brugge International Harpsichord Competition 2010. Since May 2013, he wrote several new compositions for the Viennese fortepiano, including The Eye, and recorded a selection of these. He develops a new series of graphical scores, which raised much interest in the art scene and lead to his first exposition at the AP’ART gallery in Ghent (September 2015). Franks is also a busy chamber musician and performs often with violin partner Guido de Neve. They perform the 6 Sonatas for violin and harpsichord by J.S. Bach, Flemish 18th century music, and contemporary works. In spring 2015, he played the fortepiano in a series of concerts with tenor Julian Prégardien. Other chamber music partners include Anne Cambier (soprano), Peter de Laurentiis (tenor) and Toshiyuki Shibata (traverso). Frank Agsteribbe is professor, conductor, project leader of the New Music Group, and chairman of the research board at the Antwerp Royal Conservatory since 1989. He is based in Ghent.